Alicia Vikander, Armie Hammer, Guy Ritchie, Henry Cavill, Hugh Grant, The Man from U.N.C.L.E. Guy Ritchie should pay his production designer, cinematographer, and art and costume departments boatloads of money. They make his films look so great. The Man from U.N.C.L.E. is a case in point. Look at it too closely and it’s possible to convince yourself that when Shakespeare wrote those immortal words in Macbeth, “full of sound and fury, signifying nothing,” he was anticipating Ritchie. There’s a lot of action, but not much point to the director’s reboot of the 50-year-old TV series, but it looks dazzling. It’s the movie equivalent of presents sitting under a Christmas tree, the gorgeous wrapping promising so much and delivering…socks. 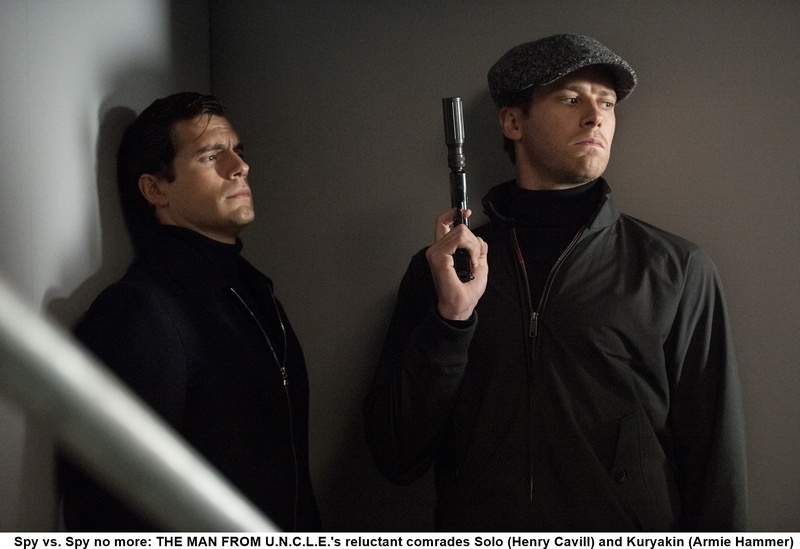 In this origin tale, CIA agent Napoleon Solo (Henry Cavill) and KGB agent Illya Kuryakin (Armie Hammer, wrestling mightily and not always successfully with a thick Russian accent) meet cute when Kuryakin trails Solo to a meeting with East German mechanic Gaby (It Girl of the moment Alicia Vikander), who Solo plans to get over the Berlin Wall. Solo is a spy, but only because he’s been blackmailed into service after being caught out as a black marketeer after World War II. (Does this mean that Solo is really The Third Man’s Harry Lime?) Kuryakin is a whiz at planting bugs, but he’s a hitter who is most comfortable in hand-to-hand combat. The two men hate each other—clearly the start of a beautiful friendship as their respective handlers insist they partner up and work with Gaby to bring down a conspiracy involving Nazis, rich Italians, a nuclear bomb, a computer disc, and Gaby’s atomic scientist dad. Vikander is the best thing going in the movie. Given the chance to demonstrate her comic chops, she steals every scene she’s in, particularly one where she tries to drunkenly seduce Kuryakin. Cavill does what he can with a character that is all style and no substance, but at least he’s not stuck like poor Hammer playing someone who substitutes feats of strength for a personality. Hugh Grant makes a welcome appearance as Waverly, a man who is a complete mystery to Solo and Kuryakin, but not to anyone who has seen the original TV series. Expect to see much more of him if sequels ensue.